Beware of hidden costs of home ownership. Ignored ownership costs lead to falling home values. Income level has little to do with affordability. Enter the dollar amount of the cash you will have available for a down payment, after all closing costs have been paid. Enter the amount without the dollar sign and any commas. Enter the dollar amount of the funds you will have available each month to make your mortgage payment and pay for all monthly home ownerships costs. Enter the amount without the dollar sign and any commas. Enter the annual percentage rate (APR) of the home loan, but without the percent sign. If your property tax rate is different from the default rate of 1.15%, change the property tax rate to more closely match that of your state's rate (without the percent sign). Based on your entries, this is purchase price of the home you may be able to afford. This is the down payment amount you entered in the top of the house affordability calculator. This is the size of the mortgage you could afford, which is the purchase price minus the down payment. Based on the purchase price and mortgage amount, this would be your loan to value (LTV) ratio. The house affordability calculator uses this figure to estimate your monthly private mortgage insurance premium. Based on your entries, this will be your monthly and annual principal and interest payment. Based on your entries, this will be your monthly and annual utility costs (1.57% of the home value per year). Based on your entries, this will be your monthly and annual maintenance costs (.39% of the home value per year). Based on your entries, this will be your monthly and annual homeowner insurance costs (.42% of the home value per year). Based on your entries, this will be your monthly and annual property tax costs. Based on the estimated loan to value ratio, this will be your initial monthly and annual private mortgage insurance premium. This premium will decrease as you increase your equity in the home. Based on your entries, this is monthly and annual total of your payment and home ownership costs for the purchase price of the home the house affordability calculator estimates you can afford. The free online calculator will calculate the price of the home you can afford based on the amount of cash you have available for a down payment, and on the monthly funds available for paying your mortgage payment and ongoing costs of ownership. 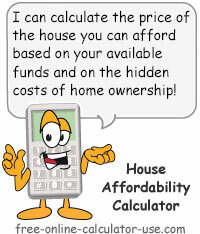 Unlike other online home affordability calculators that tell you how much house you can afford based solely on the monthly mortgage payment, this calculator includes an estimate of the monthly home ownership costs that will greatly impact how much house you can truly afford. If you are only interested in finding out the size of the mortgage you might qualify for, please visit the Mortgage Prequalification Calculator. Or, if you would like to compare buying a home versus renting a home or an apartment, please visit the Rent Vs Buy Calculator -- which includes other home affordability factors you need to consider. Enter the cash you have available for the down payment on the home. Enter the monthly cash you have available for the payment and ownership costs. Enter the term of the loan in number of years. Tap the "Calculate Affordability" button. This will populate the house affordability breakdown chart and display a pie chart depicting a visual breakdown of the payment and ownership costs. Beware of the hidden costs of home ownership. Should you believe a commissioned real estate agent or mortgage broker when they tell you how much house you can afford? That is, not unless you're on a mission to increase their financial happiness at the expense of yours. No matter what they tell you, the goal of every real estate agent and mortgage broker is to get you to buy the home that pays them the highest return for their efforts. And unless these vested sellers happen to be your loving parents or close personal friends, they really could care less if ten years from now you are forced to sell your home at a loss because you couldn't afford to keep up with the mortgage payments and all of the hidden costs of ownership they failed to warn you about. No matter what your income level, if your annual non-home related expenses meet or exceed your take-home pay, then you can't afford to purchase and maintain a home. The only number that matters when determining how much house you can afford is the difference between how much you take home and how much you spend on non-home related expenses. If you don't know how much that difference is, be sure to visit the personal budgeting calculator to get a realistic affordability number to work with. Contrary to what some real estate agents and mortgage brokers will attempt to get you to believe, just because you can afford to make the prescribed monthly principal and interest mortgage payment does not necessarily mean you can afford to purchase and own the house in question. Did Your Real Estate Agent Tell You This? According to an American Housing Survey (AHS) conducted by the Census Bureau in 2003, the average annual cost to maintain and operate a house at that time was $5,464, with 38% of that amount going for taxes, 40% for utilities, 12% for insurance, and 10% for maintenance. That's roughly $622 per month just for home ownership costs. Personally, I believe the reported maintenance figures are actually lower than they should be based on hearing numerous real estate agents report that most homeowners are failing to properly maintain their homes. In my opinion homeowners failing to properly maintain their homes is a result of purchasing more house than they could afford. After all, if you buy more house than you can afford, then all of your available funds will be going toward meeting the minimum obligations to keep your house -- leaving little if any funds for home maintenance and repairs. Of course, if you can't afford to properly maintain the house you are buying, then your house may actually fall in value (depreciate) over time. Or, even if you are properly maintaining your house, but your neighbors are not, then your house's value might fall in spite of your best efforts -- because now it sits in a run down neighborhood with falling property values. If you buy a home based on what self-serving sellers say you can afford -- without carefully factoring in the home ownership costs -- then sure, you may be able to afford to make the payments for a few years. However, as the mechanical and material parts of your home begin to wear out and need replacement, you will likely come to regret taking the sellers at their word. Due to the ignorance of home ownership costs and wrongfully assuming that their income levels would last forever, turns out that many home buyers couldn't afford their homes even if someone had given it to them for free. Of course, no one can predict what will happen with your future income. So what can you do to protect your home from economic downturns besides adding another insurance premium to your budget? The best way I know of to protect your home from the next time the greedy financial giants decide to fatten themselves up by eating their own children, is to adopt the Grow Slow, Pay As You Go Method of Home Buying.